A brown UPS truck had just departed from the Maupin household in Corvallis, Oregon. And Hannah Maupin was beaming as she carefully unwrapped the archery bow that had been custom made for her 2,300 miles away in Bloomington, Indiana. There, weeks earlier, Hannah had selected a piece of black walnut from a tree planted by her great-grandfather nearly 100 years ago. The bowyer, Scott Mitchell, had carefully melded the black walnut with strips of maple and purple heartwood so the bow would be light enough for the 13-year-old to wield, and strong enough to endure the tension required to propel an arrow more than 150 feet per second. 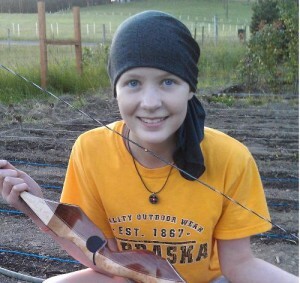 For five Wednesday evenings last spring, Mitchell and other members of the Bloomington Archery Club provided Hannah with a welcome diversion from her cancer treatments at the Indiana University (IU) Health Proton Therapy Center. Proton beams were used to treat Hodgkin’s lymphoma that had re-appeared in the seventh grader’s chest and abdomen last year. Chemotherapy and stem cell replacement at Oregon Health & Science University had preceded 28 rounds of proton therapy. Hannah’s introduction to the bowmen of Bloomington came about during a conversation with one of her proton radiation technicians at IU. “Frankie Willbanks asked me what my interests were, and I said, ‘Archery,’ ” Hannah recalled, telling Frankie she’d love to learn how to use a real bow and arrow. The tech knew that Steve Chambers, another IU proton patient, was an archery enthusiast. Chambers invited Hannah and Leah to visit a shoot at the archery club. “The first day, we couldn’t find the right-size bow,” said Hannah. “They were all pretty heavy. I was horrible. I didn’t understand the [proper] form. During her final outing at the range, Hannah received a heartfelt farewell from the Bloomington archers. They presented Hannah with all the equipment she would need to keep shooting back in Corvallis: gloves, arm guard, quiver and arrows, with the custom bow to come. This weekend, with Scott Mitchell’s specially made bow in hand, Hannah will see how true her new arrows will fly. She’ll remember the proper form taught to her by the Bloomington bowmen. And she’ll remember the incredible kindness and generosity they showed to a teen who just had a wish to try her hand at archery.